These translations are brought to you straight from the ancient Aramaic text of the New Testament called the Peshitta, which is written in the same language that Yeshua spoke, and taught, and conversed in, and was the language of the land of Israel in first century times. The Aramaic text tells us something very curious. It says that the scribe wanted to “justify” himself, and so asked a question seeking to clarify the identity of his “neighbor.” To be honest, on the surface, such a question seems entirely legitimate. However, the text gives us the insight that he was seeking to justify himself by asking this question, which means that there is something to the question itself that should alert us to the fact that it is a baited inquiry. What is it about his question, then, that is not entirely honest? He was attempting to wrest the desired answer from Yeshua that he himself wanted. But what in his question would show us this fact? The answer is found by understanding the Hebrew term used originally by the Torah in Leviticus 19:18 when it tells us to love our “neighbor.” The word is REY‘A, and means “friend / companion,” as in someone with whom you would normally associate. The Aramaic equivalent to REY‘A is the word KHAVER, meaning “companion.” It is the term used in all the ancient Aramaic Targums (translations) of the Torah. The scribe would have known the meaning of the Hebrew term used in the Torah, as well as the equivalent Aramaic term utilized in the Targum texts. However, that is not the term used by the scribe. He uses a term for “neighbor” that is very telling. The term he uses is QAREEBA, and means “near one.” It comes from the verb root QARAB, meaning “to draw near.” It doesn’t necessarily have the concept of “friend” or “companion,” but it is used in regards of a very close associate, for the root term implies intimacy, even so much as the “nearness” of one’s own torso, the innards and organs of the human being. Thus, while it doesn’t specifically have the idea of “friend,” it actually goes much deeper than that concept. The term he chose for “neighbor” signified a close intimacy, and not just a “friend” or “companion.” It is in this manner that the scribe was seeking to justify himself – by using a term the meaning of which could be easily taken to be that of a relative or kin. It is important to also note that there is another Aramaic term that the scribe avoided using that will be discussed later on in this study, and will serve to further show how he was seeking truly to justify himself in this matter, and not being sincere in wanting to fulfill the commandment of love given by the Holy One. Yeshua said to him, “A certain man was descending from Urishlem to Eereekhu, and there fell upon him robbers, and they stripped him, and they struck him, and they left him where there was little remaining soul in him, and they left. And it happened a certain priest was descending on the road, and he saw him, and he passed over. And thus also a Lewaya came, arriving to that place, and saw him, and he passed over. Yet, a man, a Shamraya, while he journeyed, he came where that he was; and he saw him, and he had compassion upon him. And he drew near, and he bound his wounds, and he poured upon them wine and oil, and placed him upon his donkey, and brought him to the inn, and cared for him. It is not readily apparent from an English translation, but the Messiah did not allow this scribe to back Him into a corner and give the answer the scribe wanted Him to say by the choice of word he used. Rather, the Messiah brought up this parable that instead forced the scribe to answer exactly what the Messiah wanted him to say. Messiah’s mastery of teaching is shown when we look at this particular account a little closer in the Aramaic. The scribe thought he was being extremely exclusive by the use of his term for "neighbor" – QAREEBA, which literally means “near one,” in his desire to justify himself and whom he loved. However, the Messiah utilized that term in a way the scribe was never expecting, and forced him to acknowledge the truth of who his neighbor is in a poignant way. Notice in verse 34, the text says that the Shamraya (Samaritan) “drew near” to the man who had been attacked. 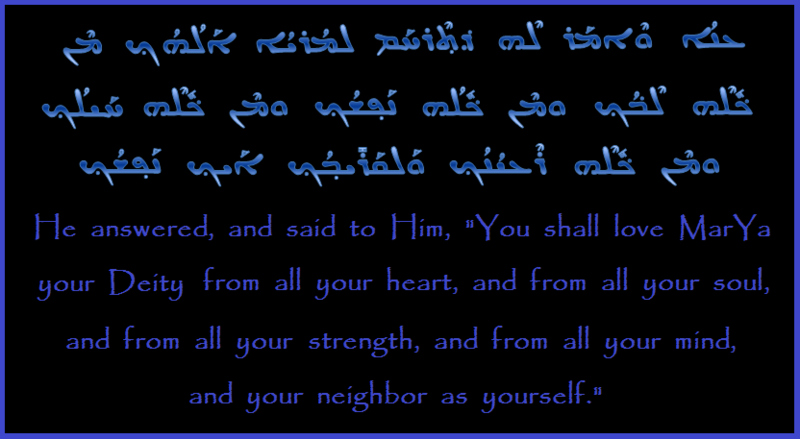 The term used at this point by the Messiah is the verb ETHQARAB, which is a verbal form of the noun QAREEBA, meaning “neighbor / near one.” Therefore, in the Aramaic text, it is very clear what the Messiah has done by saying it this way: he is telling the scribe and all who were present listening who the neighbor is: the QAREEBA “near one” is the man who “drew near” the injured individual. It is a simple yet powerful usage of the language that immediately reversed the situation for the scribe; Messiah had, with one word, baited the answer of who the “neighbor” would be for the scribe, using essentially the same term that the scribe has used to try to justify himself! Messiah gives the answer clearly in the way He worded it, and although the term for “neighbor” that was used by the scribe was chosen to bypass the inclusive nature of the Torah’s choice of words, Yeshua reversed the scribe’s intent and made this Aramaic term that was contextually exclusive to be understood as inclusive, thus dismantling the scribe’s usage entirely before everyone present. Furthermore, since this entire account is wrapped up in the concept of “love,” Yeshua also wove that very core issue into His parable in an astonishing manner, and forced again the scribe to effectively acknowledge the way in which we are to love our neighbor. Look carefully at verse 33, where it says that the Shamraya saw the injured man, and “had compassion.” The term here is ETHRAKHAM, and is a genius choice by the Messiah. This word comes from the root term R’KHAM, which has several meanings depending on the context in which it is used. The two main ways in which the root term is utilized are in rendering the word “love” in Hebrew and Aramaic, as well as the word “compassion” in those two languages. Therefore, the man who had compassion on the injured individual was intrinsically also loving that man as himself. Therefore, when Yeshua said that the Shamraya had “compassion” on the injured man, he was effectively telling everyone that the Shamraya “loved” him. This, paired with the declaration in verse 34 that the Shamraya “drew near” to the man, gives the parable great weight in the Aramaic text, explaining blatantly how to love, and who is one’s neighbor. The mastery the Messiah manifests in this account is simply amazing. Finally, when it is understood what term is used in the Aramaic to convey “love” as well as “compassion,” then our attention can be turned at last to the other possible word the scribe could have easily used to speak of a “neighbor” that would have accurately conveyed the Torah’s Hebrew word choice of REY‘A, which literally means “friend.” A term found over and over in the Aramaic text of the Peshitta New Testament for the word “friend / neighbor,” is the term RAKHMA. As you might realize, it is from the same root as the previously-addressed terms appearing in this parable of “love” and “compassion.” The scribe purposely avoided using the term RAKHMA "friend," which comes from R’KHAM, the root that can mean both “love” as well as “compassion.” This shows the unfortunate heart of the scribe. He attempted to justify himself by his word choice, yet the Messiah would not let him go far down that road. Mankind has been created to love the Holy One with all that we are. Additionally, we are to love each other, no matter who the identity might be of the other person, just as we love ourselves. The expression of that love is through the simple yet vital act of compassion. It may not be the easiest act to perform at times, but it is necessary. Life everlasting depends on it.